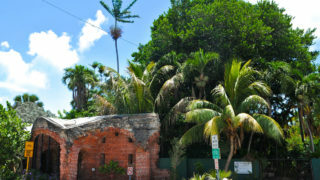 The Casa Marina Resort and Beach Club is an icon in Key West. A National Historic Site, the fort features gun mounts, a conservatory and a brief glance back at the Civil War era. Guests can view a rare collection of native and exotic trees and plants, including blooming orchids and bromeliads. A water lily pond and waterfall add to this site’s charming allure. Visitors are welcome to stroll, sit, relax and reflect at this free attraction. Remembering those who were lost to AIDS, the Key West AIDS Memorial is a touching tribute that makes a lasting impression on all who view it. The names of those who have died from AIDS are inscribed on flat granite which makes a walkway on the way to the White Street Pier. It was dedicated on World AIDS Day in December of 1997 and at that time 730 names were included. Sadly, today there are 1000 names listed on the memorial – all people who lived, visited or worked in Key West. Each year new names will be engraved until the memorial capacity of 1500 names is reached. The dedication of the new names occurs on World AIDS Day, which is December 1 of every year. A somber site, many come to remember their loved ones, family or friends. After taking a moment to view the moving AIDS Memorial, continue strolling towards the White Street Pier. It’s a favorite among locals, who refer to it as the unfinished road to Cuba. The pier is quite long and is where you’ll see friends hanging out, dog walkers and other Key West characters enjoying their paradise home. Hit Higg’s Beach for a true Key West beach experience. A popular beach wedding location, too. Locals love it and so do visitors, including brides who dream of a Key West beach wedding. The white sand and wooden pier make ideal spots for sunbathing and the beach offers umbrella rentals for those who prefer to doze in the shade. There are tennis courts, a restaurant, volleyball courts and more. For the kids, make it a point to stop by Astro City, an awesome playground located just across from the beach. The little ones can run, slide, swing and play before and after a fun-filled day at Higg’s Beach. The social spot for dogs. The park features two enclosures: one for dogs under 25 pounds and a second larger enclosure for dogs of all sizes.